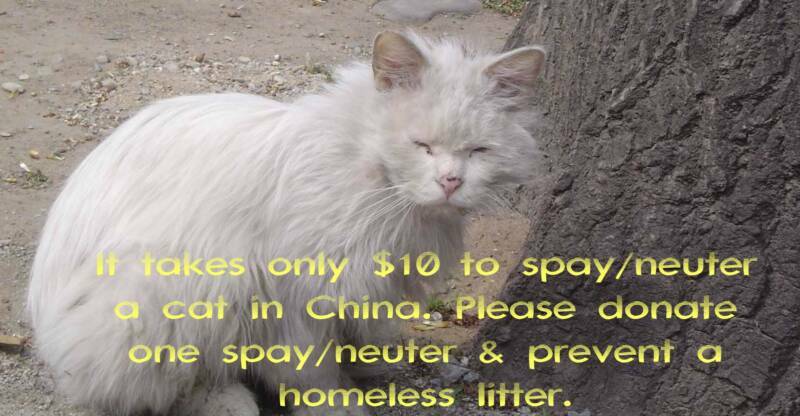 About 500,000 cats in Beijing, China may be exterminated to "clean up" the city for the Olympics. Thousands of pet cats in Beijing are being abandoned by their owners and sent to die in secretive government pounds as China mounts an aggressive drive to clean up the capital in preparation for the Olympic Games. Hundreds of cats a day are being rounded and crammed into cages so small they cannot even turn around. 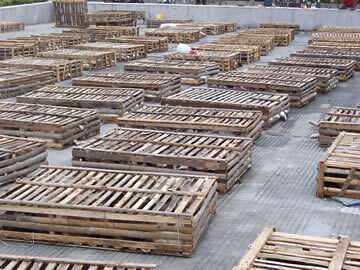 Then they are trucked to what animal welfare groups describe as death camps on the edges of the city. The cull comes in the wake of a government campaign warning of the diseases cats carry and ordering residents to help clear the streets of them. China shoots dead terrorists 'plotting attack on Beijing Olympics' Cat owners, terrified by the disease warning, are dumping their pets in the streets to be picked up by special collection teams. Paranoia is so intense that six stray cats -including two pregnant females - were beaten to death with sticks by teachers at a Beijing kindergarten, who feared they might pass illnesses to the children. China's leaders are convinced that animals pose a serious urban health risk and may have contributed to the outbreak of SARS - a deadly respiratory virus - in 2003. But the crackdown on cats is seen by animal campaigners as just one of a number of extreme measures being taken by communist leaders to ensure that its capital appears clean, green and welcoming during the Olympics. Secretive: The compound at Da Niu Fang which is patrolled by security guards. Polluting factories in and around the city are being ordered to shut down or relocate during the Games to ease Beijing's choking smog and drivers are allowed out on to the roads only three times a week. Fares on the city's underground network have been cut to just two yuan (14p) for any journey - a six-fold reduction on some routes - to keep people off buses, and beggars and street sleepers are being moved to out-of-town camps or given train fares back to their home provinces. Meanwhile, taxi drivers have been made to attend lessons in how to greet passengers politely in English and a city-wide courtesy campaign has been launched to teach Beijing's notoriously dour and grumpy citizens how to smile and be pleasant to foreigners. The cull of Beijing's estimated 500,000 cat population is certain to provoke international outrage as it comes just over a year after the Chinese were criticised for rounding up and killing stray dogs across the country. 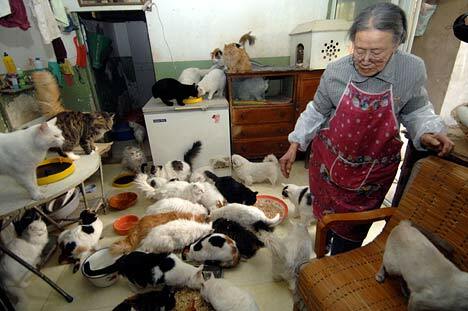 Refuge: Campaigner Hu Yuan, 80, with some of the 250 cats she has taken in at her Beijing home Animal welfare groups in China are already protesting, but their members fear punishment from the authorities. Officials say people can adopt animals from the 12 cat pounds set up around the city, but welfare groups say they are almost impossible to get inside and believe few cats survive. 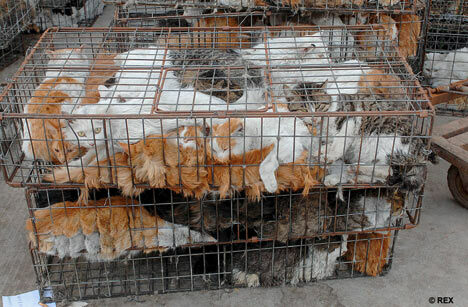 Some of the 400 cats that were rescued from a market in Tianjin. China's nascent animal rights movement claimed a rare and bloody victory today after rescuing more than 400 cats that were about to be slaughtered for their fur and meat. The felines were saved from a market in Tianjin after a standoff last week between 100 pet lovers and police that left one protester hospitalised. Until recent years, respect for animal rights was almost non-existent in China, where dogs, cats, birds, lizards and turtles are often displayed in cramped market cages, before being slaughtered - sometimes by being beaten to death. The haunting sound of animal wailing fills the air. Dogs are crammed so tightly together into tiny metal cages they cannot even bark.Yards away the blood-spattered carcasses of others lie on the ground. This is Three Birds' Market in Guangzhou, China, officially described as a poultry market. But, as these exclusive pictures show, many traders on the 60-acre site are doing brisk business selling dogs and cats to restaurants for slaughter and human consumption. Cages crammed with cats lie around the new market in Guangzhou, China. Its replacement for the Xinyuan animal market in the same city, closed down last year after international outrage over its treatment of animals and a possible link to the SARS virus. These links have some photos of the homeless cats taken care of by our volunteers. If you are able to adopt one, please write to us. A GROUP of animal lovers became embroiled in a bizarre confrontation as its members rescued more than 800 cats destined for the dinner table over the weekend. 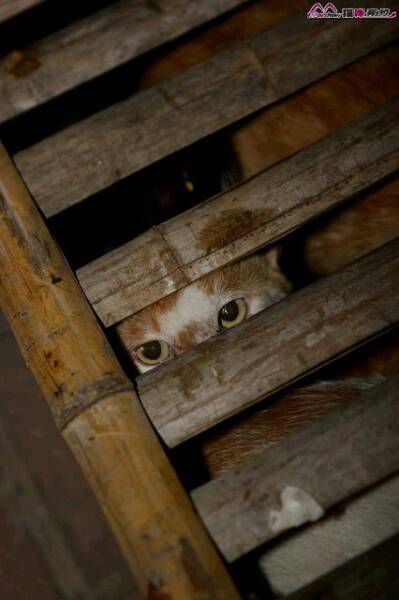 Six volunteers from the Shanghai Animal Protection Association confronted cat dealers in Jiaxing, Zhejiang Province, and spent a day and a night trying to rescue about 1,500 cats. 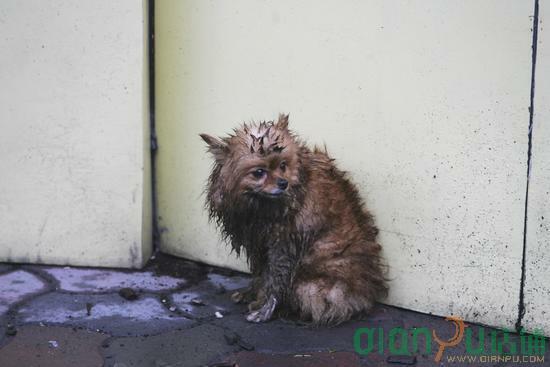 The animals were being loaded onto a container truck that was due to travel to Guangdong Province. Liu Xiaoyun, one of the volunteers, told Shanghai Daily yesterday that the cats were caged in about 70 bamboo boxes, about 20 to a box. The volunteers managed to unlock about 40 cages, releasing about 800 of the animals. "But we don't know where the remaining cages are," Liu said. "Most probably, they are on their way to Guangdong." 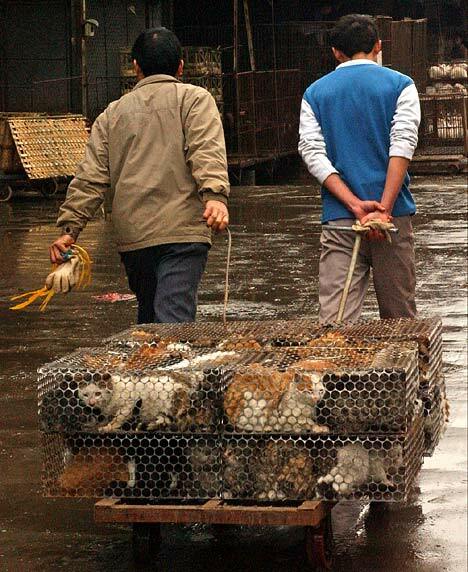 Liu said the group received a tip last Friday that the cats were at a fruit wholesale market in Jiaxing. 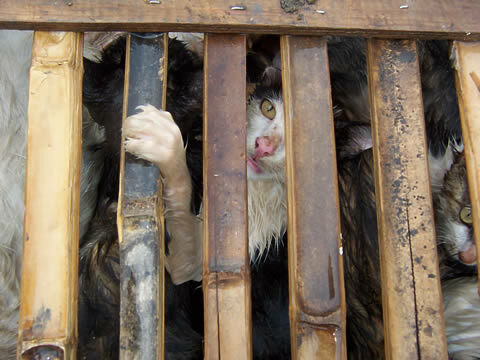 When they arrived at the market, cat traders were loading cages onto the truck. "Shill cries of cats echoed continuously," Liu said. "We asked the mongers not to send the cats, but they wouldn't listen. So I called the police." 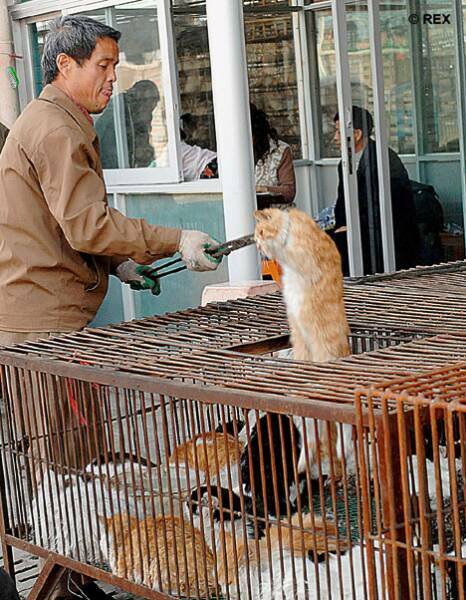 The dealers told police that all the cats were bought from a pet market and they would be raised in Guangdong. However, Liu said the method of caging so many animals in a confined space was obviously cruel. "The cats' sad and shrill screams made us heartbroken," Liu said. "In spite of the cat dealers' protests, we managed to release quite a few cats. "The cats would have had no food or drink for several days. We immediately conducted emergency aid by giving water to them." Liu said about 10 female cats had given birth. Some kittens died immediately after birth. She said the cats remained helpless under a burning sun. "When we released them, the cats jumped out in all directions at once. They've suffered so much," Liu said. The dealers showed police animal quarantine certificates and insisted on moving the remainder of the cats. With no animal protection laws to refer to, police were powerless to stop the remaining cats from being driven away. 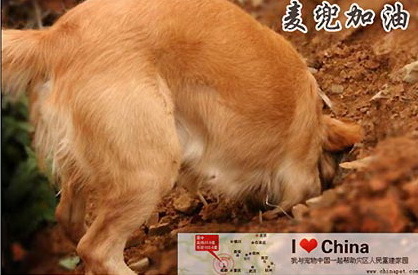 Shanghai Animal Protection Association President Zhang Yi appealed to society to cultivate better dining habits and to treat all animals more humanely. icon to visit Kate's Caring Gifts! Raise money for Anti Fur Society - Misha Foundation(Greensboro NC) just by searching the web and shopping online! THIS SECTION INCLUDES SOME NEWS ABOUT CATS & DOGS DESTINED TO RESTAURANTS. Thank you, Mr King! Your courage & compassion to inform the public about these crimes, grossly overlooked by the media in general, is nothing short of noble.